Lafayette librarians with collaborators at a Harvard workshop in April. An ocean of printed material was now available digitally. That secret project soon transformed into Google Books, with more university libraries joining the effort. By 2008, the goal to digitize collections had become less a race and more of a collaborative goal. As libraries worked closely with Google and each other, they began to consider the future of the vast corpus of digitized books being created and how libraries could best preserve it for future generations. The result was HathiTrust, a storehouse for the Google Books material, which could grow in size, scope, and services over time. That year HathiTrust launched as a partnership of academic and research institutions, offering a collection of millions of titles digitized from libraries around the world by Google, but stewarded by the libraries themselves. While HathiTrust began as an alliance between Big Ten academic institutions and the University of California system, it expanded to include other institutions. Lafayette was the first liberal arts college to join the trust in 2011. Led the way is no understatement. Today, Skillman librarians sit in leadership and advising roles for the trust. Together they are working to ensure that access to collections is open to all, enriching lives by collecting, organizing, preserving, communicating, and sharing the record of human knowledge. Dean of Libraries Anne Houston serves in a three-year appointment on the Program Steering Committee, which serves at the direction of the Board of Governors. The committee shapes the initiatives and strategies that the board considers and forms working groups to assist with work. “I’m very pleased to be serving on the steering committee because it gives Lafayette an opportunity to have a national voice representing the needs of liberal arts colleges on what I think is the most important and largest cooperative digital library project happening right now,” Houston says. Houston notes that HathiTrust has recently expanded its services to include a print retention program in which member libraries cooperate to ensure that sufficient print copies of the digitized items are retained for future access. “Hathi is really a model program for how libraries can work together to provide access to the cultural record, both print and digital,” she says. Librarian Ana Ramirez Luhrs sits on Copyright Review work group. Since 2008, more than 50 reviewers at 22 libraries have reviewed 600,000 items, determining that more than 320,000 are no longer protected by copyright and have entered the public domain. The copyright group has two programs, U.S. monographs and U.S. state and local government documents. Luhrs volunteers with the latter along with 25 others. She reviews documents for years 1923-1977. The pool of materials reviewed for this program sits at 65,500. “HathiTrust and the Copyright Review Programs are providing an important service, one that is at the core of the work of librarians—to provide access to materials that might otherwise remain inaccessible and undiscoverable,” says Luhrs. Lafayette librarians also have played an important role in the HathiTrust Research Center, the research and development component of HathiTrust. Since 2015, librarians have been working with their counterparts from University of Illinois at Urbana-Champaign, Indiana University, Northwestern University, and University of North Carolina at Chapel Hill on the Digging Deeper Reaching Further project. Funded by a three-year grant from the Institute of Museum and Library Services, the project aims at developing an open resource curriculum that trains librarians who can then train other librarians and faculty in textual analysis and visualizations. Neil McElroy, former dean of the libraries, was the project co-primary investigator from 2015 to 2016. Heidenwolf has been the Co-PI since McElroy’s retirement. Associate Director of Research and Institutional Services Lijuan Xu and Head of Electronic Resources Ben Jahre have taught and will teach workshops at a number of libraries, including Harvard University, University of Kansas, Columbia University, and the Library of Congress. 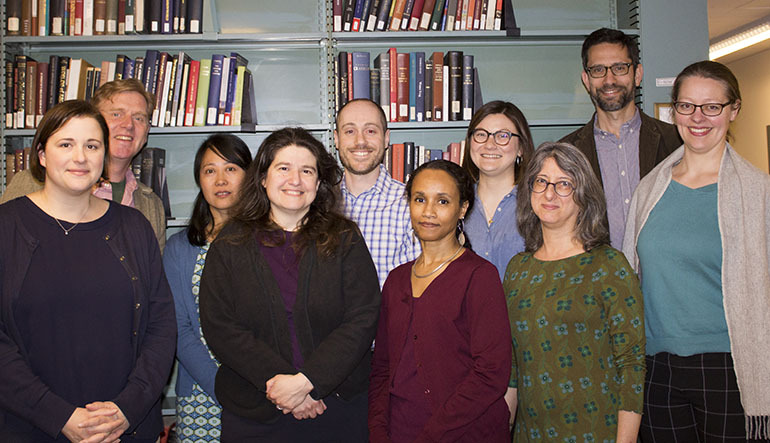 As a result of the HTRC workshop in April, Harvard University librarians have offered several workshops on their campus. At Lafayette, Xu co-taught a textual analysis workshop with Caleb Gallemore, assistant professor of international affairs, during which librarians and faculty members explored the applications of computational methods in research practices. They plan to teach another one in August. HathiTrust will continue to grow as more and more volumes are released and become available. Equal to that growth will be the appetite for material. Luckily, the College’s talent and resources will help guide that future.